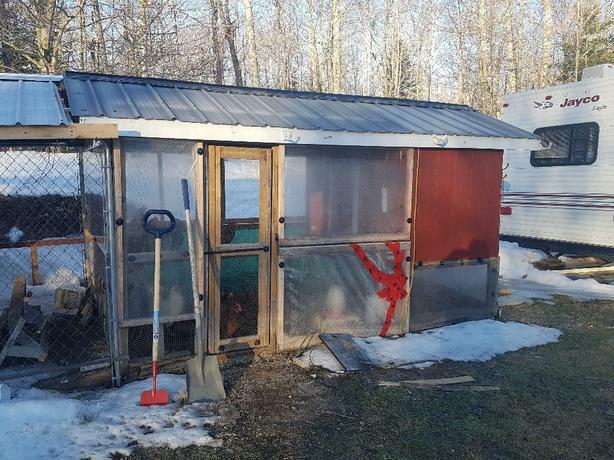 6x12 chicken coop made from 4x4 pressure treated frame and is moveable. Insulated 4x6x4'high roosting area can accommodate 15 birds. front opens up to make cleaning easy and for summer ventilation. Roosting area is lockable to keep unwanted critters such as foxes or raccoons out. Includes clear plastic removeable winter panels to keep the wind and cold out. metal roofing over entire structure. This is a carefully planned coop and has served us well for last 2 years, we have never lost a bird to predators or cold. Cleaning is a breeze, easily accessible through man door.